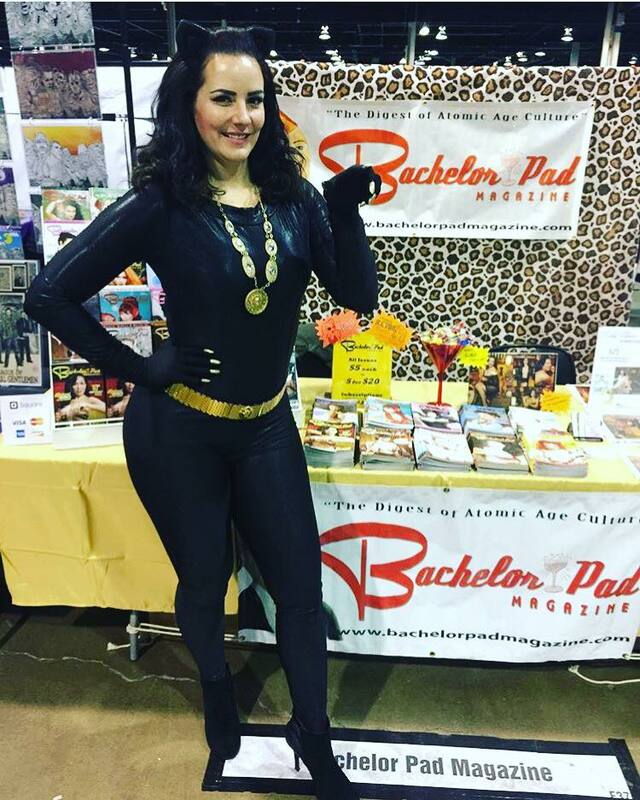 I had such a wonderful time this year with the Bachelor Pad Magazine booth! I was even able to mix a little cosplay into my weekend. Check out my gallery of outfits and photos with fans. I'm sad this post is almost a month after the Wizard World Comic Con event! At any rate, hopefully this summary of our whirlwind four days will still be entertaining. I was attending the event as a vendor with The Retro Pinups signing calendars and prints that we had for sale. My pinup gal pal, Ada Atomic, was my partner in crime for the weekend and we had fun with Sadie North and Bettie Bellini when they could join us! This was my first time attending and experiencing the "con" life and a comic con convention - and I have to say, it exceeded my expectations! The event kicked off with a short day on Thursday. Ada and I weren't anticipating many visitors on that opening night since it was the first day and happen to be a weekday. We opted to dress more casually. I wore my superman comic print skirt that I made and a print yellow sweater. People will calling me "Comic Book Pinup". Surprisingly to us, we were swamped with visitors at our booth. We signed calendars and prints and took LOTS and LOTS of pictures. I feel like we got a small taste of what the celebrities that attend these shows must feel like. We joked that our cheeks hurt by the end of the evening. We left on Thursday night feeling excited about what the next three days would hold. Oh, Thursday night was also our first taste of the cosplayers that attend these events. On our way out of the hall, we ran into a Ghostbuster who had a pretty amazing costume. The '80s child in me couldn't resist a photo! Friday was our first full day at the convention. Sadie was able to join us and the three of us decided to dress "picnic ready". I wore my gingham dress from Collectif and my faux bob hairstyle. Perfect for a summery look! This was the day we were able to get to know more of the vendors in our area. We met some really lovely people - including Java from Bachelor Pad Magazine and Ruby Joule who joined him at his booth. Sadie, myself, Ruby Joule and Ada on Day 2! We stayed consistently busy on Friday - exactly what we had expected after Thursday. We took so many pictures and had developed a few fans that returned a few times. It was great to see how well received we were since we were pretty different from the typical vendor. By the time the day was over, we were ready to get off of our feet! Some of our new vendor friends had told us that Saturday will be even busier than Friday, so we definitely needed to get some beauty sleep. We were up bright and early on Saturday planning out attire for the day. I decided to wear my new Stop Staring dress I had just received with my vintage army cap to go very traditional "pinup". This outfit was overwhelmingly popular - I'm sure because its easily recognizable. If we thought that we took a lot of photos for and with people on the two days before, we were swamped on Saturday! Some of our new fans made sure to stop by again to say hello as well! The best part (for me) about Saturday was the fact that we finally got to see some more cosplayers. Having our booth be so busy during the days was great, but we hadn't really gotten a chance to walk around the convention and see other folks. Saturday was the first day we had some cosplayers walk past - and I took full advantage of taking photos with some of my favorites. This may have been my favorite costume of the weekend - Disney's Robin Hood is my favorite Disney movie and I LOVED this reference! PLUS, the costume was amazing. Most creative for sure!! Saturday was also Ada's birthday so we did our best to give her a fun-filled day while she with us! I think we all crashed into our beds on Saturday night knowing that we still had all day Sunday. Sunday I decided to play off the success of my military outfit the day before and wear some of my Air Force gear. It was so nice to meet a few former Airmen at the event that loved my outfit. I borrowed the skirt from Ada (yay for gal pals that wear the same size!) to finish my look. Admittedly, I also planned my outfit around the ability to wear sneakers - my poor feet were so tired! Ada was dressed like Rosie the Riveter and we enjoyed playing up our "supporting the troops" bit for the day. Our streak of good luck continued on Sunday with a steady stream of new visitors and many that came back from previous days to make purchases. We also got a moment to pinup fangirl when A Vintage Vanity stopped by our booth with her nephews! On Sunday, we had the privilege of meeting the most adorable little vintage loving lady. She adored Ada because Ada looked like Lucy. It was so cute to see her have a conversation with Ada about her favorite I Love Lucy episode. (hint: she said "she couldn't pick one because there are so many good ones"!) We had to take a photo with her doing that classic Rosie the Riveter pose. By the time we closed our booth down on Sunday, we had met so many wonderful people - many of whom I'm thrilled to keep in contact with. PLUS, I think I caught the Comic Con bug - I can definitely see myself attending one just for fun.